A drawing by an artillery officer showing the view looking north-east. This was the scene of a continuous 7 day battle between 180 men of 45th Rattray's Sikhs plus 60 men of the 11th Bengal Lancers and 10,000 or more Swati tribesmen. 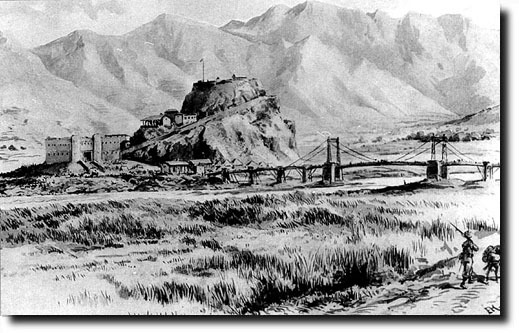 The suspension bridge was built over the Swat River after the Chitral campaign.